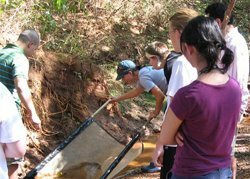 Service-learning at Oklahoma City University gives students opportunities to apply what they are learning in the classroom through service in a community-based setting. Since the inception of the service-learning program in the 2002 spring semester, OCU has offered 562 service-learning courses. 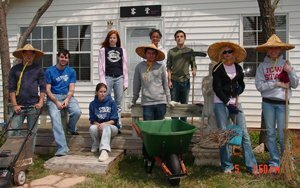 Service-learning became a part of the general education requirements for all undergraduates in the fall of 2003. Since the beginning of the program, over $1,000,000 in student labor have been donated to some 60 community organizations. ENGL 113H: Honors Composition I Students collaborate with the Oklahoma City National Bombing Memorial curators, survivors, and others directly affected by the bombing to research and create digital museum exhibits. Exhibits are displayed in the “Virtual Archives” kiosk in the museum and in Teaching trunks” distributed to elementary schools nationwide.